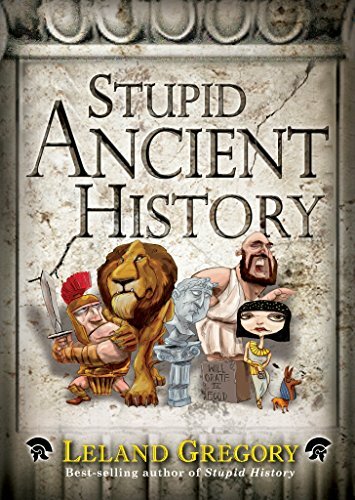 stories about ancient Greek and Roman history.New York Times best-selling author Leland Gregory is one of Andrews McMeel Publishing’s most successful noncartoon humorists. Silly, shocking, weird, hilariously funny—and outrageously true—the short anecdotes inside his anthologies of human stupidity are culled from print, online, and broadcast media from all over the world. Inside Stupid Ancient History, Gregory chronicles Greek philosophers, Roman conquerors, and historic mythconceptions, including: — To fight off Roman ships in 300 BC, Carthaginians catapulted live snakes at them.— The Athenian lawmaker Draco died of suffocation when gifts of cloaks were showered upon him by grateful citizens at an Aegina theater in 620 BC. — In ancient Rome, long before the advent of the Christian Bible, Roman men swore to “tell the truth, the whole truth, and nothing but the truth” by placing their right hand on their testicles. It is from this ritual that we derived the term “testimony.” — Of the Seven Wonders of the Ancient World, The Temple of Artemis in Ephesus burned to the ground in 356 BC. The arsonist was executed; and to make sure his wish for everlasting fame wouldn’t come true, it was ordered that his name be stricken from all records and never mentioned again. But people will talk. Despite all efforts, his name leaked, and Herostratus is remembered as one of the most notorious firebugs in history.